Searching for local and seasonal produce that doesn’t cost the earth? Look no further than your own back garden or window box! Growing your own fruit, vegetables, and herbs is simple, cheap and fun, not to mention carbon footprint friendly. Here are a few reasons to take action. Click for more info or scroll to read them all. 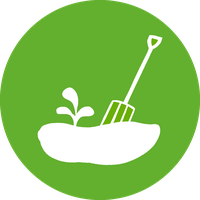 Not only does growing your own food get you outside and active, it also means that you can control exactly what goes into your produce, ensuring that it’s pesticide and additive free. Better for you and better for the planet: win! As any grandmother will tell you, home-grown always tastes better. Growing your own produce means that your food is guaranteed to be fresh, juicy and bursting full of natural flavour. And don’t stop there: preserving your produce is great fun, and cuts down on waste. The sense of achievement from being able to eat something you’ve grown yourself is a lot more satisfying than merely picking up some vegetables at the supermarket or grocery store. Plant some seeds and help them grow: it will be well worth the wait! Processing, packaging, storage and transportation of food all uses a lot energy, leading to increased carbon emissions and a warmer planet. Growing your own cuts out the middle men, and means that you can guarantee your food is always fresh and available, without having to leave the comfort of your own kitchen. In September 2017, a historic agreement was signed by UN member nations agreeing to work towards 17 Global Goals for Sustainable Development by 2030, otherwise known as the SDGs. Achieving these ambitious goals will require action from governments, businesses, NGOs, and individuals alike. We can - and must - all play our part. 1. Start off with something easy and seasonal: check out the Royal Horticultural Society’s month-to-month guide for when to sow, grow, and harvest your fruit and veg. 2. Check out the Love The Garden website for step-by-step guides on how to grow everything from carrots to tea. 3. Pick the right spot: gardener and writer Sarah Raven suggests a sunny, sheltered spot, clear of any over-hanging trees or sun-blocking buildings. 4. Your local garden centre is your new best friend: as well as supplying you with seeds and equipment, it’s also a great place to pick up knowledge and advice from gardening experts. 5. If you’re really short on space, try a large pot or window-box - you'll be amazed by how much you can grown. BBC has some great tips on growing veg on a window sill. Worked on planting herbs but have not had good success. Will try again with different plants. Will not give up. My big allotment was under-cultivated & looking sorry for itself due to new job & little time to keep it up. I asked a friend who lives locally to share with me & now with the two of us working on it little & often, it is looking a lot better! I have a big patch of Kale, which I eat all the time, and managed to get lots of salad from it. It is looking much better and we have big plans for next year!! Loads of veg in the ground, my potatoes are looking good, carrots, beetroot and spring onions all growing. Herbs in pots, and salad leaves etc. Can't wait to get eating it all! It was a difficult time of year to start growing so I used pots. If they make it through winter I will plant them in the area that will now be my garden and add more. It's been fun. I planted chilly seeds, and they have now grown into small plants with white chilly flowers. I also planted coriander and tulsi seeds, and they have grown into small plants. I love growing my own -this just encouraged me to do more. It tastes so much better than shop bought, so it's a total win. I have planted some leek seeds, which are now happily sprouting! Looking forward to a lovely harvest in a couple of months. And I'll do it again next year, maybe with a second planter. I am now sharing an allotment with Kayleigh - tomatoes and corn are in, beans are on the way! I am now growing broccoli, lettuce, tomatoes, celeriac, peas, broad beans and a selection of herbs in my very small garden. I already do nearly all the pledges you had listed so it was great that you inspired me to start getting active with growing and permaculture. Cheers! Garlic & chives planted. Bit early yet for the seeds to go in. Need to fix the greenhouse down.